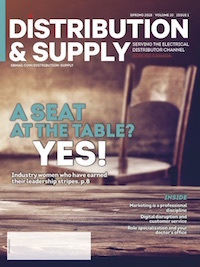 DISTRIBUTION & SUPPLY Magazine remains the only independent Canadian voice of Canada’s electrical channel. D&S provides distribution personnel valuable information so they can do their jobs better and run their businesses more profitably. Subscribe today. Despite being quite male-dominated, our industry is increasingly welcoming women into positions of leadership. We profile some of these “women in power” to learn more about how they got involved in the industry, the challenges they faced and what still needs to be done to close the gender gap. It’s a common mistake and an easy trap to fall into: thinking that Marketing is just a function of Sales, but it’s so much more. A marketing specialist both complements and bolsters your sales efforts. To help drive this point home—and to inspire your own marketing efforts—we speak with marketing specialist Katrina Olson, and profile some of Electro-Federation Canada’s 2017 Marketing Award recipients. Competition is fierce and distributors are pressured to keep up in a marketplace with shrinking margins. To futureproof their businesses, decision-makers should be prepared to embrace challenges and be creative when tackling changes in the marketplace. Thankfully, there are new ways for navigating the market and uncovering opportunities. PLUS... insights from EFC’s Rick McCarten and CEMRA’s Sue Adler, and a special Go To Market column by Mike Marks, who says we can all learn a lesson in role specialization... from our doctor’s office?